Depth map is an image that contains information relating to the distance of the surface of scene objects from a view point. 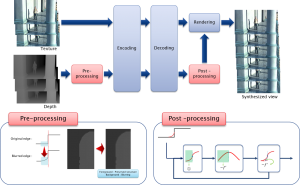 In this work, we propose new system for improving coding performance of multi-view and depth map (MVD) system using properties of depth map. The proposed method consists of two stages. 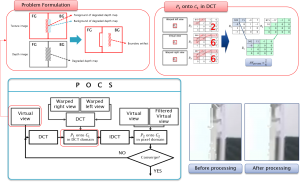 In the pre-processing stage, dept map is filtered selectively to reduce the bit-rate cost while minimizing quality degradation. In the post-processing stage, decoded depth map is restored.